I love a lot of films, who doesn’t? (Apart from my mother, whose film loves are limited to Mamma Mia!, Chitty Chitty Bang Bang and Mrs. Brown, but she’s odd.) I do have favourites, permanent ones, but I’ve talked about them a lot and it’s nice to have some other conversations sometimes, so here’s a couple that I love today. I didn’t get around to seeing this until last night, but I wanted to the moment it came out. The reason it took me so long to stick it on is that I’m always a bit wary of Sofia Coppola films, because, whilst universally more beautiful than all other films available, they usually make me sob with infinite melancholy and awe. That’s fine, indeed, sometimes it’s perfection, but it means that, unless you’re 15 and rocking the wet eyeliner/pretty emo look, you choose your moments to watch such things with care. This film definitely has all those feelings in it, and it is beautiful and aching and sad, yes, but also sweet and amusing and occasionally bizarre. And it doesn’t leave you feeling grim. It’s gentle and eerie and curious and if you don’t mind a film in which not all that much happens on the outside, and indeed nothing at all happens for at least the first half an hour, there’s a great deal to enjoy here. Not least the fact that Stephen Dorff is still hot. Yes. The best part of it all is that it’s made with confidence and skill, and every performance in it is exquisite, including that of the camera. This is precisely my kind of film. 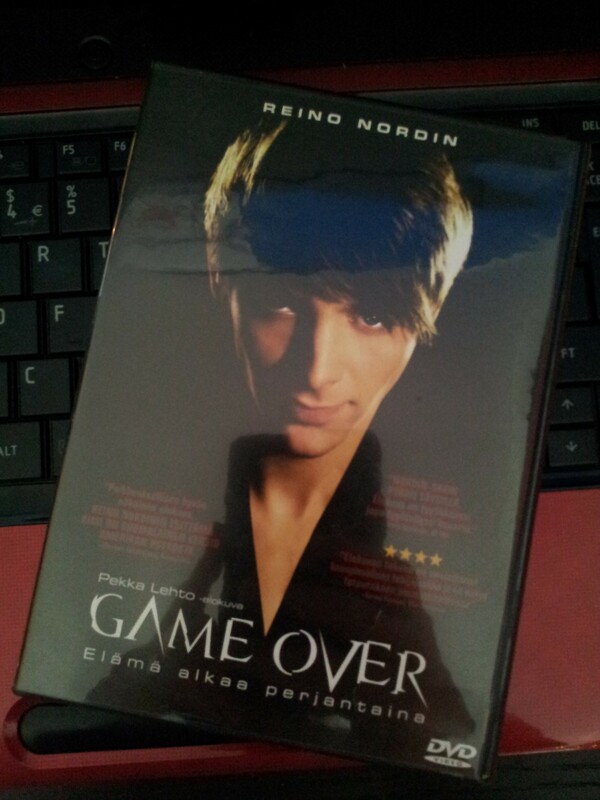 I bought this DVD when I was living in Helsinki and didn’t have anything to watch, so I headed out to Sokos and bought the film with the most attractive cover. It turned out to be a good plan. Kimi (Reino Nordin) is beautiful and crackers. And dangerous. He also manages a floorball team with his friends, and, via the inevitable suitcase full of cash, winds up in a complex and terrifying web of murder and bravado. Both easy and creepy watching, not exactly a landmark in Finnish cinema, but good, grim entertainment. I liked Katy Perry, when she turned up everywhere suddenly all technicolour, kissing girls and liking it and that, but I didn’t exactly care about her. I liked her progressively when her songs earwormed me, and by the time Firework was released I figured, eh, that’s a nice positive song, you clearly know a thing or two about pop music. We went to see her live, and then I decided I might love her a bit, because the gig was like the happiest, most fun club night imaginable (notably also much more enjoyable than 99% of the nights I’ve ever had in clubs – certainly the dancing was better), and she had so much energy that I was exhausted just watching. But this is a great piece of documentary. Even if you don’t like her or don’t care about her, this film has the gift of telling you someone’s story, rather than just showing their ‘crazy wonderful word!’ It makes you infinitely more appreciative of the sheer level of work that goes into a world tour, for starters, and it’s also nice to see that someone who, from a distance, appeared plucked from nothing and foisted infinitely on the world, worked damn hard to be there. Also, I would really like the first album she seems to have wanted to make. I miss shouty early ’00s girlrock. A lot of the write-ups I’ve seen about this film focus on the uncompromising amount of content about the disintegration of Perry’s marriage, which is understandable, because it’s a bit unexpected in the middle of a film that might have, marketing-wise, been mistaken for a 3D gig movie, but it’s only half the story. An interesting, even shocking, rather heart-breaking half, but to focus only on that, and the amount of times she appears without make-up (really, that seems to have been some magazines’ only take-away), misses a very sizeable chunk of what’s to appreciate here. If you happen upon this, try it. She’s quite something. At the beginning of the film, an excitable, about-to-walk-on-stage Katy Perry is shown, as her voiceover says something like, “Since I was nine years old, I’ve dreamt of walking out on stage and having everyone sing along with me.” That’s the thing. Not everyone chanting my name, like many a would-be star. Everyone singing along with me.